The only developable land mass overlooking Ridgway Lake & State Park, this +/- 2,509-acre ranch is ideal as a private retreat or development property. 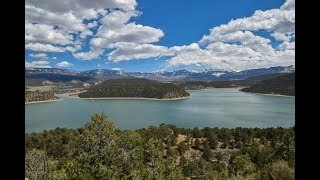 With two miles of lake-view property line overlooking Ridgway Lake and the stunning San Juan Mountains including 14,000 peaks, this ranch is one of the rarest properties available in the United States. San Juan Gateway Ranch is located only 40 miles from Telluride, 8 miles from Ridgway, and 20 miles from the commercial airport at Montrose. Featuring elevations ranging from 7,000 - 7,800 AMSL and untouched wilderness, the ranch is teaming with wildlife and game including Elk, Muledeer, Bear and Turkeys. Minutes from Uncompahgre National Forest and only 2 miles from the Divide Ranch & Club 18-hole golf course, opportunities for recreation are endless. With over 1.5 miles of Ouray County Road frontage, electricity on-site, municipal water available, and being located in the High Mesa Zone, which allows 35-acre residential tracts with the potential for higher density, this property is ideally situated for an incredible development opportunity. Bordered on the North by BLM land and on the East by Ridgway State Park & Lake.